It is our solemn duty to pray for the poor souls in purgatory. They are suffering and longing to be with their God. Why Should We Pray for the Souls in Purgatory? The Poor Souls Are Suffering – They’re Really Suffering! We do not know for sure what form the purification takes, but we know that purification of the soul in purgatory is extremely painful. Therefore, we should pray to bring them relief. Most of Us Will Experience Purgatory – Don’t You Want As Many People Praying For You As Possible? One of the benefits of praying for the poor souls is that, one day we will need friends who will pray for us. These poor souls will one day be in heaven and will pray for you, when you’re going through your purification. The Catechism of The Catholic Church tells us that the poor souls will be eternally grateful. “In the communion of saints, “a perennial link of charity exists between the faithful who have already reached their heavenly home, those who are expiating their sins in purgatory, and those who are still pilgrims on earth. Between them there is, too, an abundant exchange of all good things” (CCC 1475). Therefore, it behooves us to periodically make atonement for this disregard of the Lord’s Sacred Heart and at the same time, we can sometimes offer it up for the Holy Souls in Purgatory. Here is an example of an Act of Reparation to the Sacred Heart of Jesus. The Rosary for the Holy Souls is basically the standard rosary but it specficially mentions and remembers the souls in purgatory. Here is an example of how this is beautifully done. You don’t need to say a special prayer. You just need to ask the Lord that the graces you would have received at that particular holy communion be applied to the Poor Souls. “The practice of Gregorian Masses goes back to a tradition hailing from Pope St. Gregory the Great (540-604). According to legend, a deceased monk appeared and requested 30 Masses to be celebrated for the release of his soul from purgatory. On completion of the stipulated days he appeared once more radiant in heavenly glory. From this legend the practice of celebrating 30 consecutive Masses for one and the same person with the intention of procuring release from purgatory became an established custom which has been regulated in various ways over the centuries.” EWTN. Here is a place that offers Gregorian Masses. 5) Pray the Eternal Rest prayer. Get into the habit of praying the “Eternal Rest” prayer whenever remember, like when you pass a cemetery, after your meals, or before you go to bed. St John Macias used to sprinkle Holy Water on the Ground for the souls in purgatory. Give up something small for the intention of providing relief for the Holy Souls in purgatory, or add an extra devotion, especially when you don’t feel like it. Speak to those in your parish about praying for the Poor Souls in Purgatory. I know a woman who has an apostolate where she hands out for free, copies of Hungry Souls: Supernatural Visits, Messages, and Warnings from Purgatory. In that way, she helps Catholics to learn about the plight of the poor souls and encourages then to pray for them. 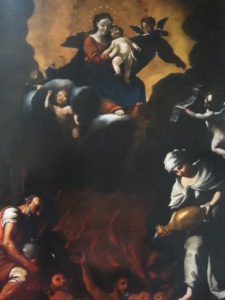 For those who never had a devotion to the Poor Souls in Purgatory, I hope this article has convinced you to at least set aside some time, daily, weekly or even monthly to help the Holy Souls in Purgatory in some small way. There will come a time when we will all need the same attention.